Fixed a Simple bug with windows info. display labels. Fixed Bug with MS office 64bit and 32bit issues reported by the user! Fixed Bug where Windows 10 Product key is displaying incorrectly. – View Windows 7 Product/CD Keys. Win Keyfinder 2.0 is a small Freeware utility, which is 100% clean safe and secure which retrieves your Microsoft Windows 7, Windows 8, Windows 8.1, windows XP, windows 2000, windows ME, 98, 2003 and .NET both 32bit and 64bit Operating system Product keys from the registry and display it for you. It does not generate any product key it merely displays the key stored in registry. 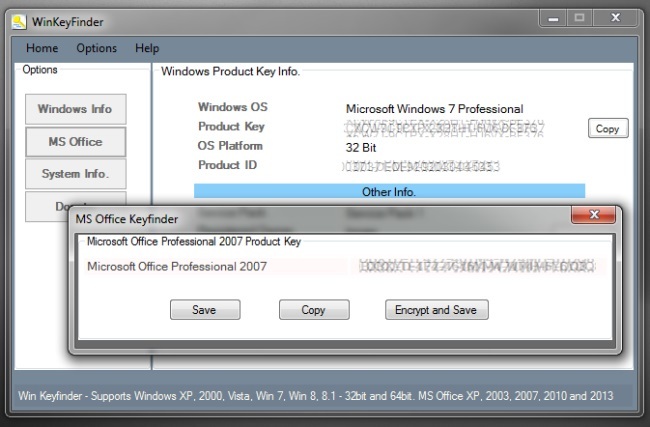 It also retrieves Microsoft Office Product key stored in registry. Provision for Saving the key using Encryption for safety and security. Provide support for Windows 32 bit and Windows 64 bit Operating Systems. Download now to find out your self about Win Keyfinder. To know what Win Keyfinder 2.0 features are visit this page here. While Running WinkeFinder.exe, some Antivirus programs may display an alert and/block you from running it. – Office 2013 installers remove all but the last five characters of the install product key once the installation completes. – If you have an installed version of Microsoft Office 2016 or 2013 via your Office 365 subscription, you don’t need to worry about product keys. Just sign in to your account and download and install the latest version of Office 2016 to your computer. – For Some Operating Systems and MS Office Product key is not stored in Registry for such situation Product key not found message is displayed. – If you purchased a computer/ bought a seconds from AN OEM manufacturer such as Dell, HP, Lenovo etc. Please keep in mind that the product key that is used while installing Windows may be different from the one mentioned on the License sticker. doesnt match product key on my sticker i used to install windows. The reason for this is that the Computer which comes with per-installed windows Operating, has a OEM Product key, and it is usually installed using a single product key, this saves them time and money, a single installation is cloned and copied over to new machines. The key on the sticker is bundled with your machine which might not have been changed/updated. Works very good. I found my win key in a second. Thank you. Please try some old Winkeyfinder versions, the latest version does not support windows 98, the support for it has been taken away. Would be nice, if a non booting/external Drive could be analysed ! Hi Babu, are you not viewing Product key for Office 2016 pro? in Win keyfinder 2.0.1? If you have an installed version of Microsoft Office 2016 or 2013 via your Office 365 subscription, you don’t need to worry about product keys. Just sign in to your account and download and install the latest version of Office 2016 to your computer. But… Make sure you pick the Office 32 bit version. The Office 64 bit version isn’t compatible with all other software such as Adobe Acrobat. You’ll run into other problems. We had to downgrade 5000+ computers. As per my test system, I think it works for 32 bit Office also, I will test and make any changes to code and update, thank you. Don’t work on my russian version of Windows 7 Professional. Product Key looks as BBBBB-BBBBB-BBBBB-BBBBB-BBBBB. I tried different versions of program. Some times when product key is not stored in Windows Registry you get this error. In such cases I suggest you to try https://account.microsoft.com/devices and get your Digital License stored in your Microsoft account for future reference. Hi, I have a problem because the keyfinder does not read because it only sees something like BBBBB-BBBBB-BBBBB-BBBBB-BBBBB. Do you have any idea how to read the key? Hello, where do I download the 2.03 version? I have an older version that says its 2.0.0.0. When I run it, it shows me a key. I downloaded a newer version of winkeyfinder, it also says it’s 2.0.0.0, but the release notes with it say 2.0.1. Running it gives me a different key. Which one do I believe? 2.0.3 is on same 2.0 download page, 2.0 is not available for download. I have many PCs at work and all of them are showing the same key number. Did you use the same product key while installation? Where can I download version 2.03? I download from WinKeyFinder but it seems to me that it is version 2.00 and version 2.01 is written in the “Release Notes.txt” file. Please send a link to version 2.03. File is correct, release notes might not have been updated, which I will fix today. Thanks for point it out. I tried finding my Win 7 key, but found that it couldn’t find it. Tried to decrypt the key, but I need a password for that, but I have no idea what that might be and how to find it.